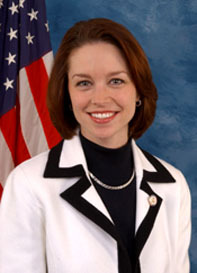 Attorney and executive elected to US Congress in a 2004 special election to succeed Bill Janklow, who resigned after being convicted of manslaughter. Conservative "Blue Dog" Democrat; anti-gay rights, pro-gun rights, pro-PATRIOT Act. Supported 2009 economic stimulus; opposed 2008 Wall Street bailout, 2010 health care reform. Defeated in 2010 election and succeeded by Kristi Noem. Her grandfather, Ralph E. Herseth, was Governor of South Dakota from 1959-61, and her grandmother, Lorna Buntrock Herseth, was South Dakota's Secretary of State from 1973-79. Her father, Ralph Lars Herseth, was a long-time state legislator in South Dakota, and her husband, Max Sandlin, is a former US Congressman from Texas.